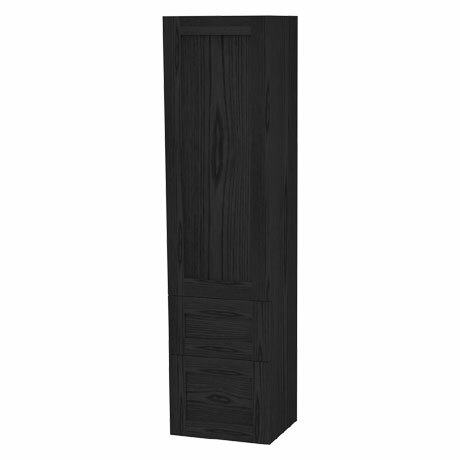 Offering classic beauty with clean lines and finished in black stained oak, this tall cabinet from the London collection offers a practical storage solution for toiletries and towels. Features a fixed door storage in wood with 3 shelves and a soft closing door with an option of a left or right hand opening. The unit also has 3 internal adjustable wood shelves and two soft closing drawers with anti-slip mats, the bottom drawer is fitted with an adjustable bar to stop larger items from moving. All units are fitted with mounting rails and brackets for adjustable and quick installation. Comes with a set of three polished chrome handles to add character to this stunning piece of bathroom furniture. Largely made of veneered panel materials. Drawer fronts and doors are made of solid oak.